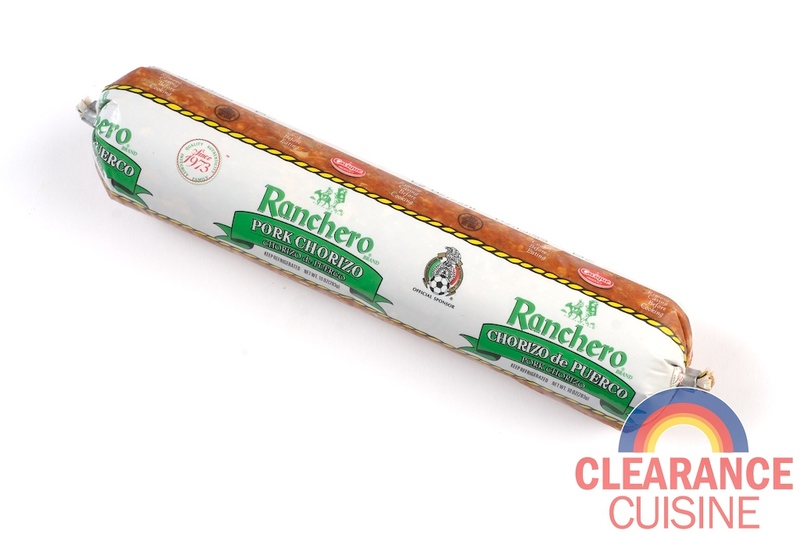 I stood in front of the foreign refrigerated section in Saar’s Marketplace trying to figure out the difference between Cacique and Ranchero brand chorizo (and deciding between beef and pork). 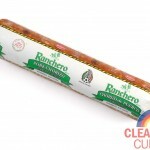 I ended up picking the Ranchero brand since it had a soccer ball on the wrapper (turns out they’re a “proud sponsor of the Mexican National Soccer team”). Olé! Turns out Ranchero/Cacique has a Breyers/Edy’s deal goin’ on – the website mentions: “In Illinois, Michigan, Wisconsin, and Indiana our Ranchero® Brand is sold under the label “Cacique® Brand“). So in essence, it’s a good thing I chose the Ranchero because the Cacique would have come from the Midwest. Just what a raw meat product needs is more transit and shelf time. Simply put, this product is mostly fat: 260 calories with almost 60% of your daily recommended value of saturated fat per serving (and there’s 4 servings per tube). Since this blog has nothing to do with healthy eating, this is more of a side note than a warning. Atkins/low carb devotees can rejoice – only 3g of carbohydrates per serving! I figured the easiest way to prepare this would be scrambling it up with some eggs and eating it for breakfast. I quickly Googled a recipe and I was set. Now I know you foodies out there may chastise me: I used the whole package (10 oz) of chorizo to 6 eggs instead of the 4 oz that the recipe mentioned. 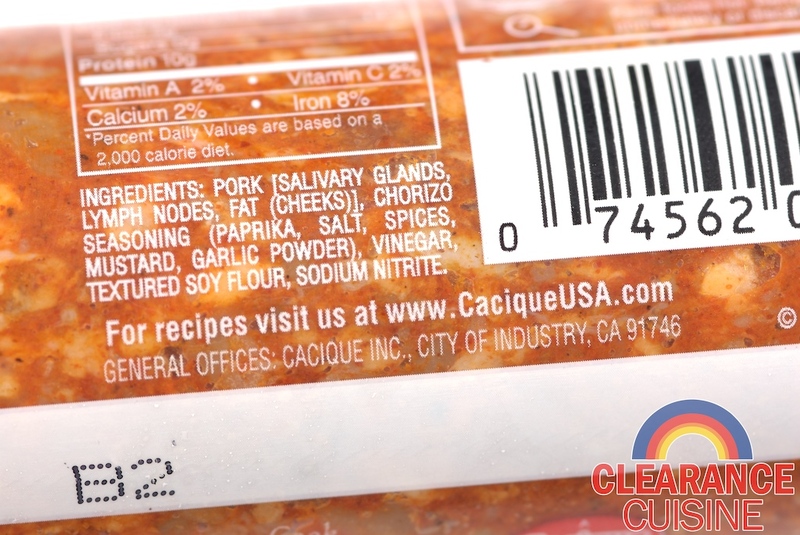 With whole eggs plus the greasy chorizo, that is a lardaceous amount of dietary fat. While I did add some onions and cilantro, obviously this product isn’t of the highest quality anyway and I ended up with a sort of Hispanic hangover hash. It was palatable, but my stomach was wondering what it did to deserve this fatty fate. 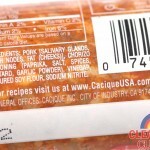 I wouldn’t mind trying chorizo again, but definitely in a different dish (and perhaps a brand from say, Whole Foods). I would opt for the beef flavor so I can experience the thrill of beef tongue, cheeks, nodes ‘n’ glands. Andrew Zimmern, eat your heart out. This entry was posted on Wednesday, March 9th, 2011 at 6:00 am	and is filed under Food. You can follow any comments to this entry through the RSS 2.0 feed. Both comments and pings are currently closed.